EMV chip technology has arrived. Is your POS terminal ready? 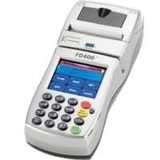 The FD130 Duo Terminal allows you to accept payments quickly and gets you ready for the latest in EMV chip-enabled payment devices.The FD130 Duo Terminal from First Data paired with the FD35 PIN pad is an affordable solution that combines performance, reliability and ease of use in compact, feature-rich devices. The best part is the FD130 Duo Terminal is ready for EMV. The FD130 uses cutting-edge technology to enable you to accept transactions when a customer presents you with an EMV card; a card embedded with a special chip that adds an important layer of security. 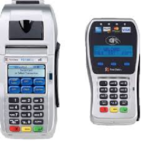 In addition to the added security, the FD130 Duo Terminal gives you full range of solutions for payment processing, including credit, debit, gift cards, personal paper checks, EBT and contactless payments. a full range of payment options. You’ll have access to wireless downloads wherever you are. The First Data™ FD300Ti terminal is the ideal solution for operations that need to keep track of sales for separate businesses (as many as 99) that are housed at the same location. Its multi-merchant capability allows each owner to conveniently designate which business the sale is applied to at the time of the purchase. Each merchant receives an individualized statement listing only his own transactions in an easy-to-read format. The FD300Ti accepts all major credit cards, as well as PIN, signature and contactless debit cards*. Security precautions are built in, with only the last four digits of the cardholder’s account number printed on the receipt. The terminal also accepts gift cards and Electronic Benefits Transfer (EBT) cards*, and it processes traditional paper checks* as well as electronic checks through the TeleCheck Electronic Check Acceptance® service. © 2018 Electronic Payment Services LLC. Electronic Payment Services, LLC. is a registered ISO of Wells Fargo Bank, N.A. Concord, Ca. Powered by First Data.